It is 10:07am here in Indian Lake Estates, FL as I type. Including the time that I spent optimizing the 7 images here this blog post took almost 6 hours to prepare. I hope that you enjoy it. This post marks 196 consecutive days with a new educational blog post. With so many folks getting in the habit of using our B&H links and our Amazon logo-links why quit now? April, May and June have been fantastic as lots of folks are getting the message; using my affiliate links does not cost you a penny and helps support my efforts here. To show your appreciation, I do ask that you use our the B&H and Amazon affiliate links on the right side of the blog for all of your purchases. Please check the availability of all photographic accessories in the BIRDS AS ART Online Store, especially Gitzo tripods, Wimberley tripod heads, and the like. We sell only what I have used and tested, and know that you can depend on. We will not sell you junk. We know the tools that you need to make creating great images easy and fun. And we are always glad to answer your gear questions via e-mail. This image was created at 7:03am on June 10, 2014 with the Gitzo 3532 LS carbon fiber tripod, the Mongoose M3.6 head, the Canon EF 200-400mm f/4L IS USM lens with Internal 1.4x Extender, an external Canon Extender EF 1.4X III (with the internal extender in place at 784mm–the max), and the Canon EOS 5D Mark III . ISO 400. Evaluative metering +2/3 stop: 1/80 sec. at f/22 in Av mode. Color temperature: 8100K. Live View (for mirror lock) and 2-second timer. 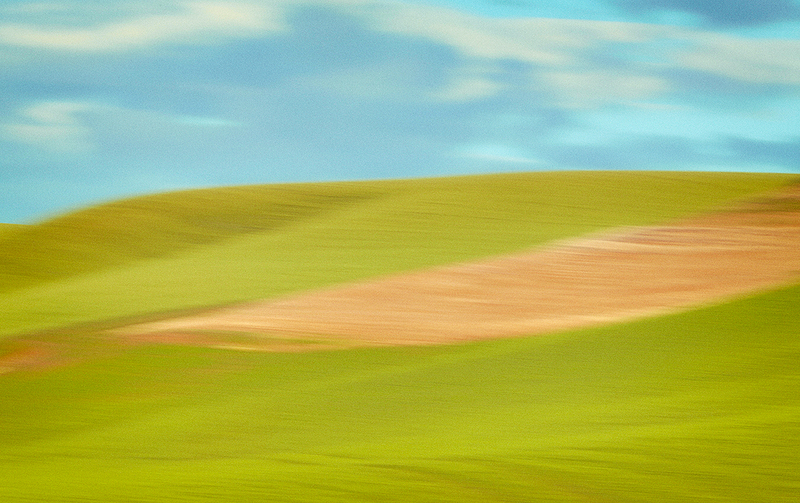 I used the 2-4 for probably 75% of my Palouse images. 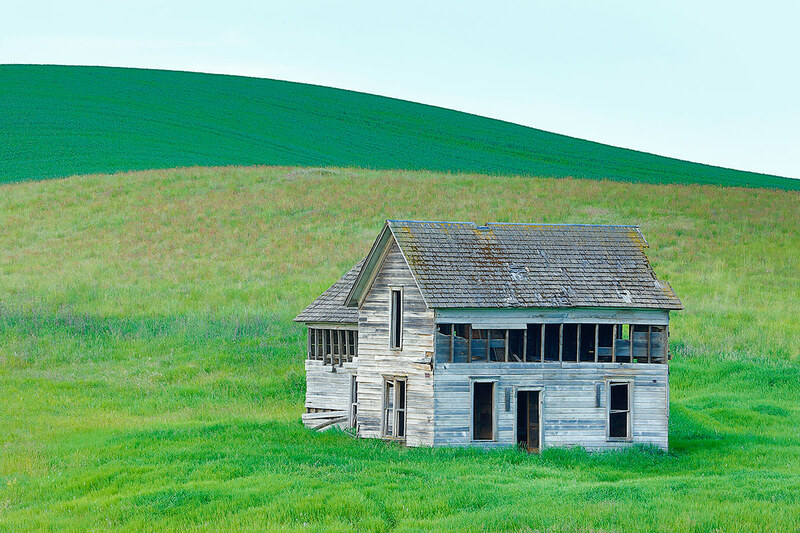 The ability to work with focal lengths in the 200-560mm range in and instant and to get out to 784mm in ten seconds as above makes the 200-400 the ideal long lens for Palouse photography. Throw in the Canon EF 70-200mm f/2.8L IS II USM lens and the figure above rises to 95%. I am just not a wide angle type of guy. 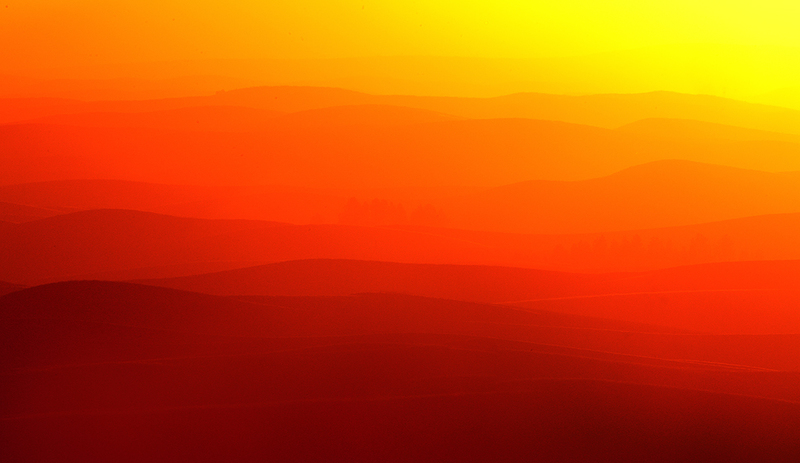 On each of our 6 mornings on Steptoe Butte we learned a bit more about photographing sunrise there. 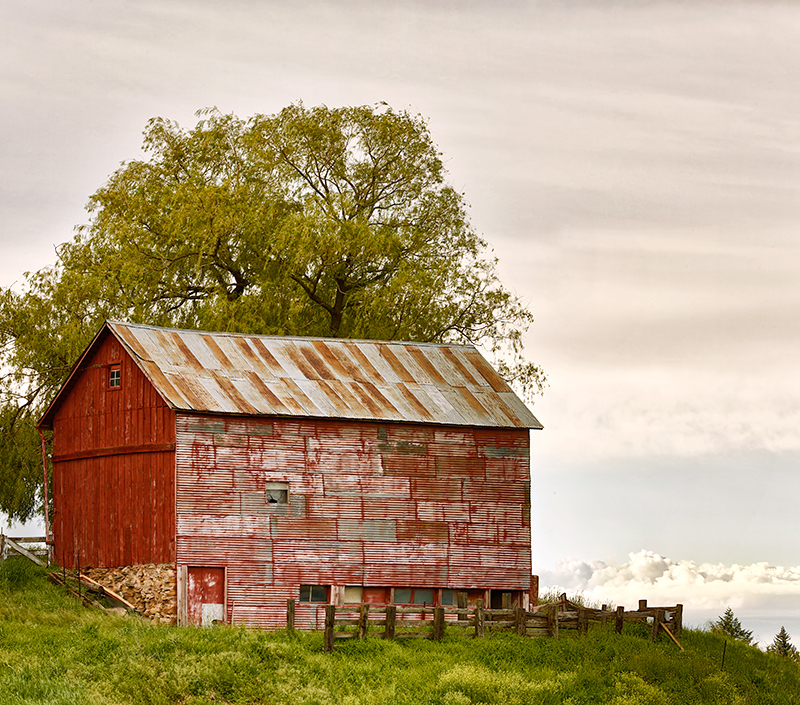 This top and bottom stitched pano was created from two 3-frame in-camera Art Vivid HDR image. It was created at 6:27am on June 10th. I used the Gitzo 3532 LS carbon fiber tripod, the Mongoose M3.6 head, the Canon EF 70-200mm f/2.8L IS II USM lens (at 175mm) and the Canon EOS 5D Mark III. ISO 400. Evaluative metering +2/3 stop +/- two stops around the base exposure of 1/30 sec. at f/18 in Manual mode. Color temperature: 8,000K. Live View (for mirror lock) with the 2-second timer. AI Servo Rear Focus AF on the left corner of the barn and re-compose. Click here if you missed the Rear Focus Tutorial. Click on the image to see a larger version. My favorite short-intermediate telephoto zoom lens, the 70-200mm f/2.8L IS II, was the perfect adjunct to the 200-400 with internal extender. Together they gave me focal length coverage from 70-784mm. As above, I used one of these two great zoom lenses to create 95% of my Palouse images. The Gitzo 3532 LS carbon fiber tripod topped by the Mongoose M3.6 head is the perfect tripod/tripod head combo for this pair of lenses. When I needed to be on a tripod with a short lens like the Canon EF 24-70mm f/2.8L II USM or the “circle” lens, the Canon EF 8-15mm f/4L Fisheye, I’d spin off the Mongoose m3.6 and mount the Giottos MH 1302-655 (Tiny) BallHead on the 3532. To save time I kept the Wimberley P-5 camera body plate on my 5D III for the entire trip. This 3-frame in-camera Art Vivid HDR image was created same day at 7:03am with the Gitzo 3532 LS carbon fiber tripod, the Mongoose M3.6 head, the Canon EF 200-400mm f/4L IS USM lens with Internal 1.4x Extender (at 247mm) and the Canon EOS 5D Mark III . Evaluative metering +1 2/3 stops +/- two stops around the base exposure of 1/125 sec. at f/16 in Av mode. Color temperature: 4500K. Live View for mirror lock and 2-second timer. AI Servo Rear Focus AF again on the left corner of the barn and re-compose. Click here if you missed the Rear Focus Tutorial. Click on the image to see a larger version. I’ve long said that if you are not learning, thinking, and trying new stuff every day in the field you might as well give up photography and take up knitting. While I have loved the Art Vivid HDR setting since from the first time that I tried it I am the first to admit that when working with greens and yellows (remember that there is lots of YELLOW in GREEN) in a variety of lighting conditions that the colors may be over the top; the greens and yellows will be too saturated. To tone those colors down I experimented by changing the color temperature to 4,000, 4,500 (as here), or 5,000K. I was quite happy with the results. If you go back to HDR Natural you need to remember to go back to AWB, Shade, or Cloudy. I am hoping that with continued experimentation that I will be able to use Art Vivid for all of my in-camera HDRs…. Thanks to BAA friend Don Nelson for the tip that led us to discover this old house. It was the lovely setting and the soft light that made this one special. This 3-frame in-camera Art Vivid HDR image was created same day at 8:20pm with the Gitzo 3532 LS carbon fiber tripod, the Mongoose M3.6 head, the Canon EF 200-400mm f/4L IS USM lens with Internal 1.4x Extender (with the internal TC in place at 307mm) and the Canon EOS 5D Mark III . ISO 400. Evaluative metering +1 stops +/- two stops around the base exposure of 1/320 sec. at f/13 in Av mode. Color temperature: AWB. Two rows down and two sensors to the right of the Central Sensor/AI Servo Rear Focus AF as framed was active at the moment of exposure. Click here if you missed the Rear Focus Tutorial. Click on the image to see a larger version. To create images like the one above you will want to work tight, be sure to parallel the subject, and use an intermediate aperture (f/13 here) to ensure sufficient depth-of-field. Note that I carefully designed the image around the three cracks where the boards meet near the right frame-edge. Without any GREENs I went with Art Vivid HDR with AWB to juice up the colors. This 3-frame in-camera Art Vivid HDR blur was also created on June 10th. This one at 8:05pm with the Gitzo 3532 LS carbon fiber tripod, the Mongoose M3.6 head, the Canon EF 200-400mm f/4L IS USM lens with Internal 1.4x Extender (with the internal TC in place at 307mm) and the Canon EOS 5D Mark III . ISO 100. Evaluative metering +2 stops: 1/4 sec. at f/20 in Av mode. Color temperature: AWB. AI Servo Rear Focus AF on the near edge of the dirt patch, re-composed, and panned slowly from left to right. Click here if you missed the Rear Focus Tutorial. Click on the image to see a larger version. Simply put, creating in-camera HDR Art Vivid pan blurs is fun. I love the almost childlike quality and the soft colors of the resulting images. This image was created as part of a 3-frame in-camera Art Vivid HDR sequence same day at 8:20pm with the Gitzo 3532 LS carbon fiber tripod, the Mongoose M3.6 head, the Canon EF 200-400mm f/4L IS USM lens with Internal 1.4x Extender (with the internal TC in place at 461mm) and the Canon EOS 5D Mark III . ISO 800. Evaluative metering +1 stop: 1/60 sec. at f/11 in Av mode. Color temperature: AWB. The RAW file was converted in DPP. AI Servo Rear Focus AF on the prominent line of yellow grass and re-compose. Click here if you missed the Rear Focus Tutorial. Click on the image to see a larger version. Take a gander at the 7 images presented here today. It is hard to believe that all of them were created in a single day during two shooting sessions. But they were. 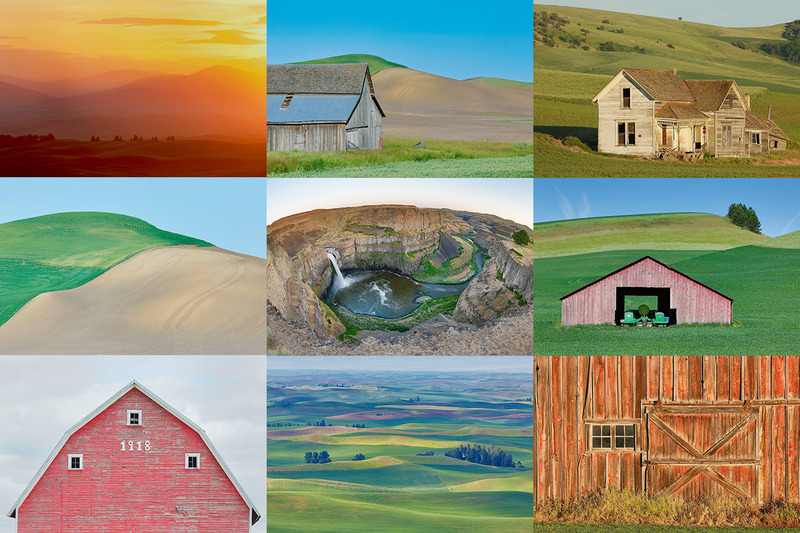 It is the incredible variety of situations, colors, and subjects that makes the Palouse such and amazing photographic location. Please take a moment to leave a comment and let us know which of the 7 images you like best and let us know why you made your choice. 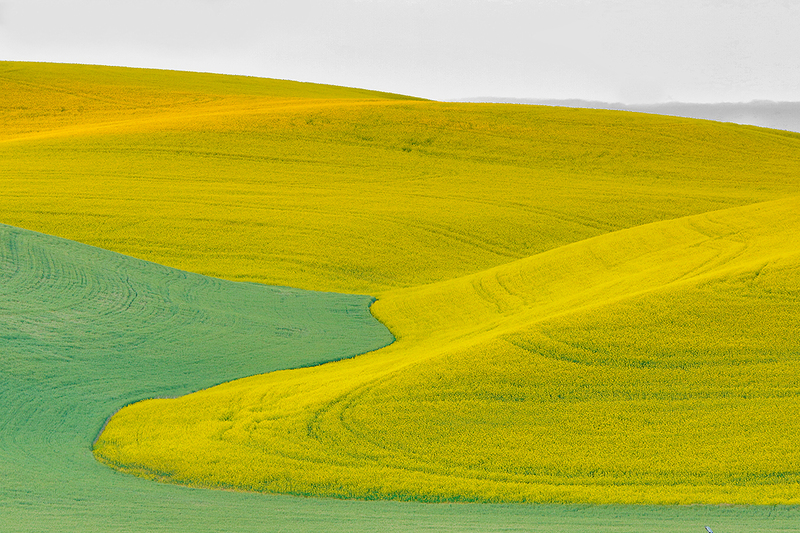 While I was looking east and photographing the canola hilsides, Denise Ippolito was looking to south. She created a series of images of the hillside patterns above and shared them with Lynn and me. As it was a nice combination of triangles and circles we joined her. This three frame in-camera Art Vivid HDR image was created at 8:33pm on June 10, 2014 with the Gitzo 3532 LS carbon fiber tripod, the Mongoose M3.6 head, the Canon EF 200-400mm f/4L IS USM lens with Internal 1.4x Extender, an external Canon Extender EF 1.4X III (with the internal extender in place at 455mm), and the Canon EOS 5D Mark III . ISO 800. Evaluative metering +2 stops: 1/10 sec. at f/11 in Av mode. White Balance: Shade. Live View (for mirror lock) and 2-second timer. 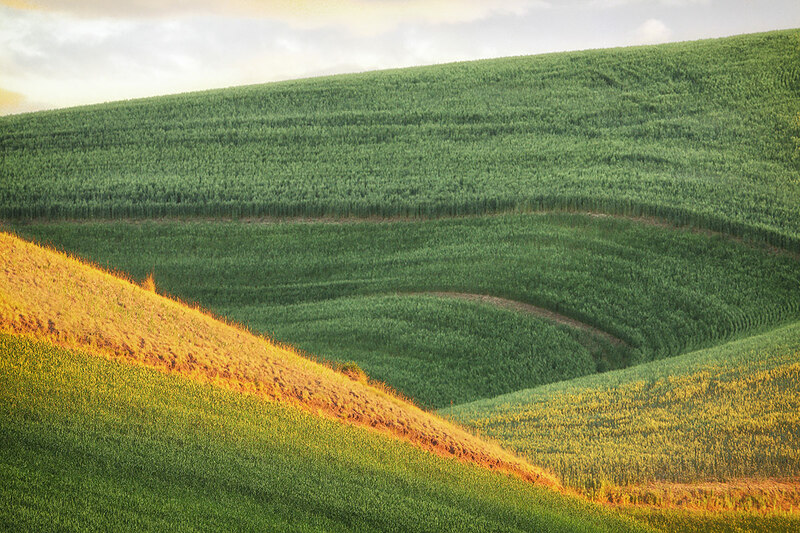 On our way west, we found a nice hillside planted with canola-the yellow blossoms, and photographed it side-lit. Nothing too special but canola fields were on the scarce side this year. As we headed back to the hotel we came around a curve in the road and we all gasped at the sight of hillsides of canola replete with dramatic black shadows. We had discovered the mother lode of canola. Or not. As we drove up a bit to turn around we realized with chagrin that the “new” canola fields were the same ones that we had photographed 90 minutes earlier. Viewed from a different angle in different light had changed things dramatically. Yes, perspective matters. What’s the lesson? Be sure to take a close look at your subject from as many different angles and positions as possible. Sorry I’m a bit late on this one. Artie, can you please explain to me why you stopped down for the ‘Old barn close-up’ image? Why would you require extra depth-of-field for a flat surface that is perpendicular to you? Can you share a bit more about in- camera HDR blurs? Why, if you’re panning as taking 3 images, is there not a problem lining the 3 up as a composite? Very nice work Arthur! I love the first three and the canola field photo the best. 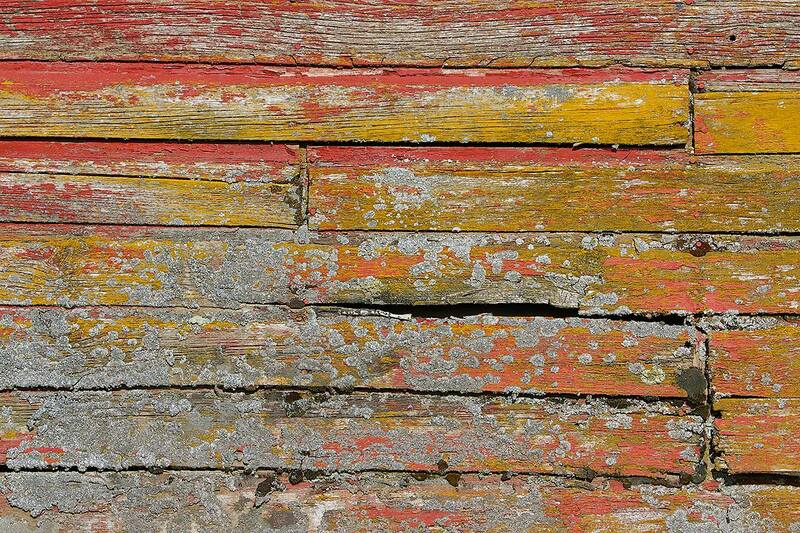 Old barns and abandoned homes are wonderful and a ton of fun to photograph. Tanks Andrew. I love that last one….